WMMpress via Nanaimo Daily News: Shaun in Nanaimo! Article excerpt: The Grapes of Wrath and Odds featuring Shaun Verreault of Wide Mouth Mason play at the Florence Filberg Centre, Jan. 24, 2014. WinterBites Concert + Stay packages for the double bill are being offered through Old House Village Hotel & Spa ($94.50 per person) and Holiday Inn Express Hotel ($99.95 per person). Individual tickets are $40. Doors open at 8 p.m. and show at 9 p.m. Ticket information, packages and concert listings are available at www.winterbitesfestival.com. Musicians Care concert, February 12, 2014! 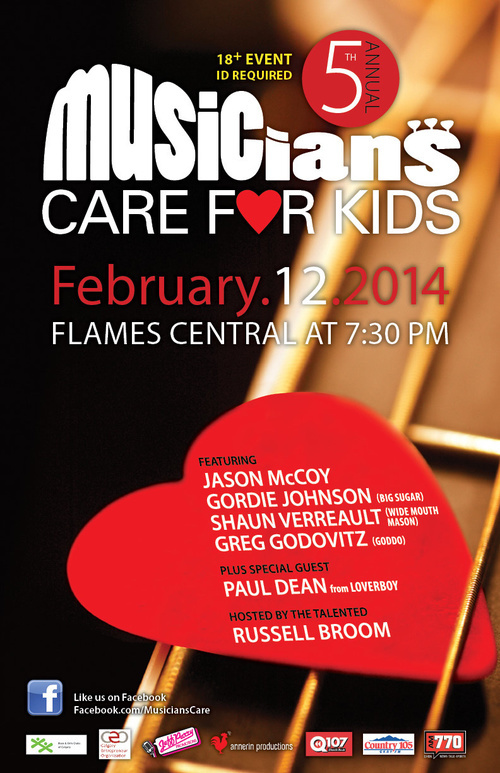 On February 12, 2014, Shaun Verreault and Gordie Johnson of Wide Mouth Mason will be participating in the Musician Cares concert in Calgary, Alberta, Canada. Musicians’ Care For Kids is a 18+ gig at Calgary’s Flame Central (219 – 8 Avenue SW) that will feature Shaun and Gordie along with other musicians. Hosted by Calgary’s own Russell Broom, this event has helped to raise monies for the Boys and Girls Club of Calgary with 100% of the net proceeds going to the Avenue 15 program. The Avenue 15 program provides homeless and runaway youth ages 12 to 17 with temporary shelter and basic needs. Tickets to the event are available at Ticketfly.